HM Hospitales – Madrid’s Leading International Hospital! I am so fortunate to say that in all my years of travelling abroad I have never had to visit a hospital. Aside from a few trips to a walk-in clinic here and there for minor issues, I have been able to travel pretty carefree! It’s because of this carefree feeling that I became a little bit lazy when it came to health insurance, which I wholeheartedly regret. Since I never ended up using the insurance on my trips, I went for the cheapest and most basic plans. To be honest, hardly any medical centres I went to, accepted my insurance. But, since they were very minor incidences I didn’t mind. It went on like this for about 3 years, with no hiccups and no worries! Well, until a few months ago. After a very strange experience which resulted in chest pain and almost fainting on the metro, I needed to get help, quickly. I was in a bit of a panic because I had no idea which hospitals accepted my insurance and no time to find out. 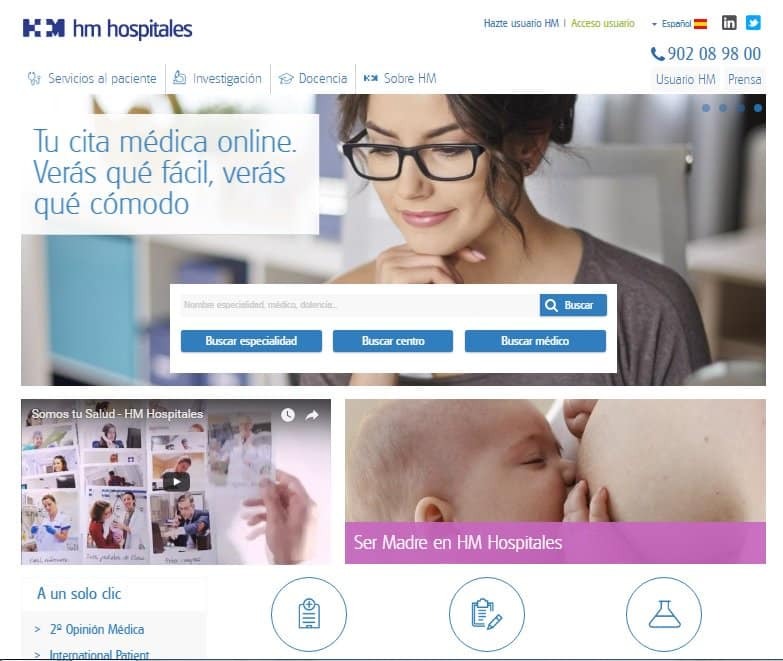 But my friend immediately advised me to go HM Hospitales, a private hospital in Madrid – because they are a renowned international hospital that deals with a lot of foreigners and a lot of private insurance policies. I took the advice because even though my basic Spanish can navigate me through most things, I felt much more comfortable knowing I could speak english with the staff! There are 7 HM Hospitales in Madrid, even out in Alcala de Henares, which are all open 24hrs a day! I visited the centrally located El Hospital Universitario HM Madrid by Metro San Bernardo. When we walked in, we were welcomed at reception and right away the receptionist asked if I was local, or international – aka am I a foreigner. So I pulled out my passport and said I was from Canada, and she called in the “international team” to welcome me. You see, HM has an entire international department, with staff that speaks over 6 languages and who are genuinely supportive people. They asked me about my symptoms and for all the necessary documents (in english). I only had to wait about 5 minutes before they returned and had me sitting with an english speaking doctor. They continuously came to check up on me and to inform me what was going on. I was there for a blood test and some cardio tests, but the hospital offers a wide range of services for its patients. The hospital itself it very clean and comfortable, things move decently fast there and the staff is attentive to everyone. So after a few hours of tests and treatments they asked me back into the international department office. I assumed this is where we sorted out the method of payment, and the typical rigamarole of me calling my useless private insurance company and haggling for coverage. But, they had already done it while I was in with the doctors. They informed me that they did the negotiating for me, that everything was covered by my insurance and I was free to go. If I had invested in proper private insurance, I would never have had to worry, but knowing that they took care of it anyway was a wonderful feeling. At this point I genuinely felt taken care of. Being sick abroad can be an extra stressful dilemma and the staff at HM really make me feel comfortable and in good hands. I have since returned to El Hospital Universitario HM Madrid for follow up appointments and routine check-ups. It is my go-to place for any medical issues and will be for a long time! I highly suggest making a note of this place, and even checking out there services online. So, if you’re taken by surprise like I was, you have a safe and secure place to go!